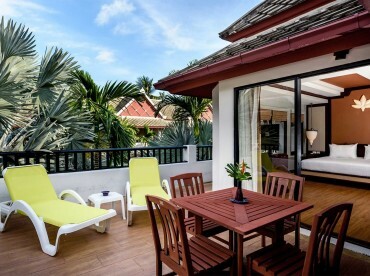 Looking for the perfect Honeymoon Hotel in Thailand? Dreaming of a perfect romantic getaway? The Honeymoon Suite at Novotel Samui Resort Chaweng Beach Kandaburi is ideal for couples looking for unforgettable Samui Resort experience. The 135 m² Honeymoon suite features a living room, bedroom with comfortable double bed for a goodnight sleep. Enjoy spectacular sunsets at a large private balcony overlooking the sea and equipped with sun lounges. The suite features LCD TV, minibar, tea/coffee making facilities and complimentary WiFi. Large en suite bathroom includes a bathtub, shower, free toiletries and a hairdryer.